1% of every purchase goes to the NAU Foundation. You bleed blue and gold. Now you can pay with the NAU Affinity Credit Card from OneAZ. Whether it's your first home, a custom build or your vacation home, we have the perfect mortgage loan option for you. Lock in our Lowest Rates! Auto, Credit Card and HELOC! Purchase your dream home or refinance to reduce your payments today. Experience that new car smell the affordable way! Redeem rewards your way with our low rate Choice Rewards Credit Card. OneAZ Credit Union helps you find the right home financing. APR = Annual Percentage Rate. Rates include a .25% discount on auto loans with automatic payment deduction from an OneAZ Credit Union checking account; rates will be .25% higher on loans that do not meet this requirement. Payments are not adjusted with the discount. Subject to credit and program guidelines. Get a credit card that meets your needs, whether it's a low rate or great rewards. Life happens. Put your home’s equity to work with an affordable HELOC. Don’t you just love that new loan smell? Enjoy all that Arizona has to offer with an affordable recreational vehicle loan. 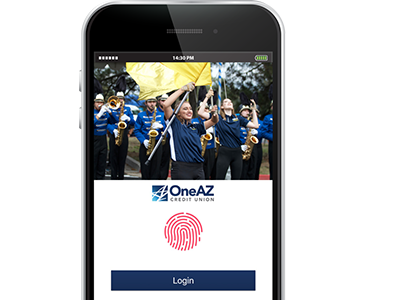 Check out the free OneAZ mobile app for fast and easy access to your accounts anytime and anywhere from the convenience of your Apple or Android device.